SheiKra, a roller coaster at Busch Gardens Tampa, a theme park located in Tampa, Florida, in 2010. SheiKra is a roller coaster that was added to the Stanleyville area of the park. Mark Rose, vice-president of design and engineering, proposed the idea for the roller coaster. Peckham Guyton Albers & Viets, Inc. (PGAV) planned and designed the coaster, which opened on May 21, 2005. Less than two years later, Busch Gardens announced that it would remove the floors of SheiKra's trains. The ride shut down temporarily on May 28, 2007, and reopened on June 16, 2007. Busch Gardens opened as a hospitality facility for Anheuser-Busch Companies, Inc. on March 31, 1959. Busch Gardens originally hosted a brewery with beer tastings, but it was closed in 1995 and the roller coaster Gwazi was constructed in its place. In 1965, Serengeti Plains, inhabited by African wildlife, opened. In 1971, the Serengeti Express Railway, a two-mile railroad surrounding the park, was opened. The Stanleyville section opened, including the Stanley Falls Flume in 1973. In 1976, the Congo area opened, featuring Busch Gardens' first roller coaster, Python. Various theme areas and attractions have been added to the park over the years. From 1976 through the 1990s, the theme park was called Busch Gardens: The Dark Continent, but was renamed Busch Gardens Tampa Bay during that same decade. From 2006 to 2008, the park was renamed Busch Gardens Africa. In 2008, it returned to its original name. The park is currently owned by SeaWorld Entertainment and the Blackstone Groups. Busch Gardens includes several themed areas in addition to the Edge of Africa: Morocco, Stanleyville, Congo, Jungala, Pantopia, Nairobi, Crown Colony Plaza, and Egypt. Original color digital image by Ray Cepero, March 10, 2010: Private Collection of Ray Cepero. Digital reproduction of original color digital image by Ray Cepero, March 10, 2010. Tampa Collection, Hillsborough County Collection, RICHES of Central Florida. Originally created by Ray Cepero. Copyright to this resource is held by Ray Cepero and is provided here by RICHES of Central Florida for educational purposes only. "PARK INFO." Busch Gardens Tampa, SeaWorld Parks & Entertainment. http://seaworldparks.com/en/buschgardens-tampa/park-info/?from=Top_Nav. Cepero, Ray. 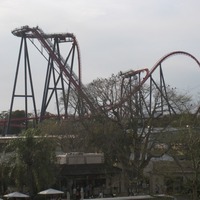 “SheiKra at Busch Gardens Tampa, 2010.” RICHES of Central Florida accessed April 24, 2019, https://richesmi.cah.ucf.edu/omeka/items/show/4466.